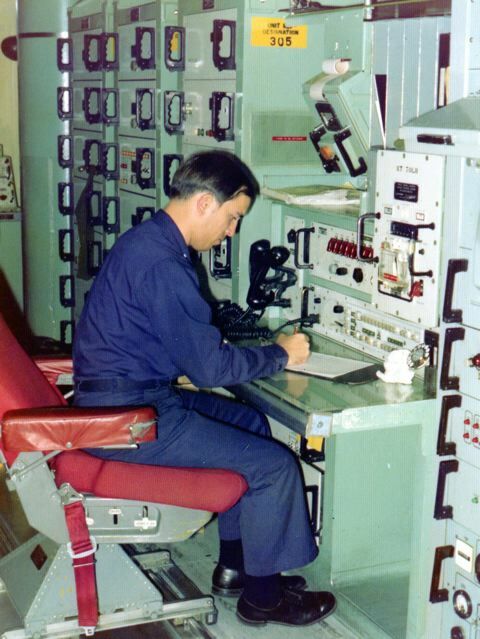 During the early '70s I was stationed at Whiteman Air Force Base, Knob Noster, Missouri, as an ICBM Minuteman II Flight Commander. 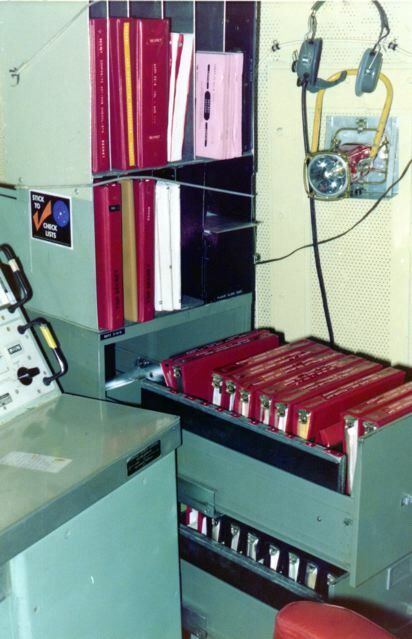 Below are some photos of a Launch Control Center (LCC) that was located at Whiteman. 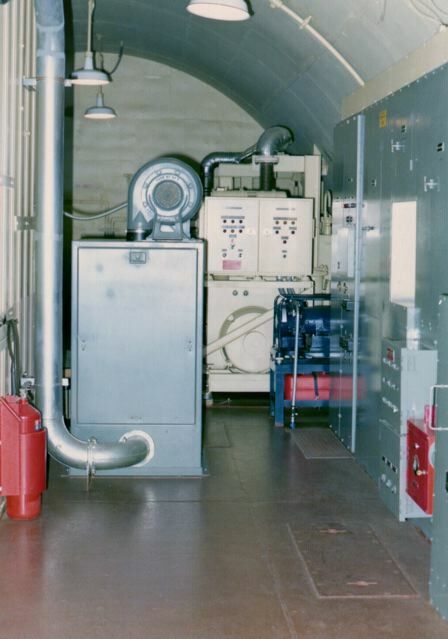 At the time there were three missile squadrons at Whitman, the 508th Strategic Missile Squadron, the 509th Strategic Missile Squadron, and the 510th Strategic Missile Squadron. 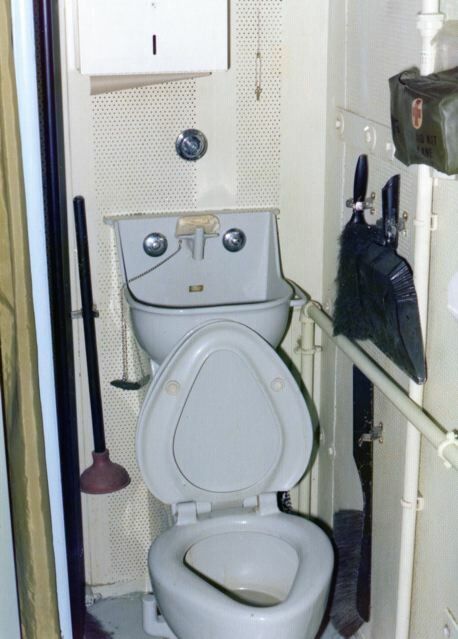 Each squadron had control responsibility for 50 ICBM missiles with atomic warheads. Each missile squadron contained five LCCs with prime responsibility for ten missiles each. The LCCs and the missiles were spread over a wide area of the Missouri countryside and some missile crews had to drive as far as ninety miles to their LCC. Whiteman is now a B2 stealth bomber base and all missile sites have been deactivated. However, there is still one LCC open for visitors, Oscar LLC, located on the base itself. 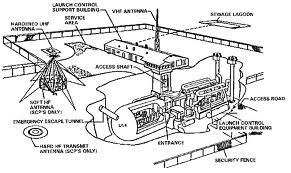 Above is a diagram of a typical Launch Control Facility. All personnel enter through the building shown in the upper center. shown in the lower center of the diagram and was shaped like a medicine capsule. 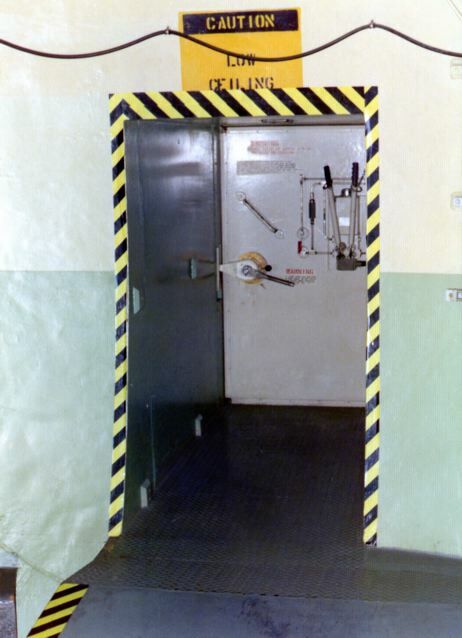 Launch Control Center blast door. It would take the bad guys quite a while to work their way through that door. You gotta love those Air Force issue glass frames. A little light reading for those long boring hours on alert. Deputy dog at his work station. 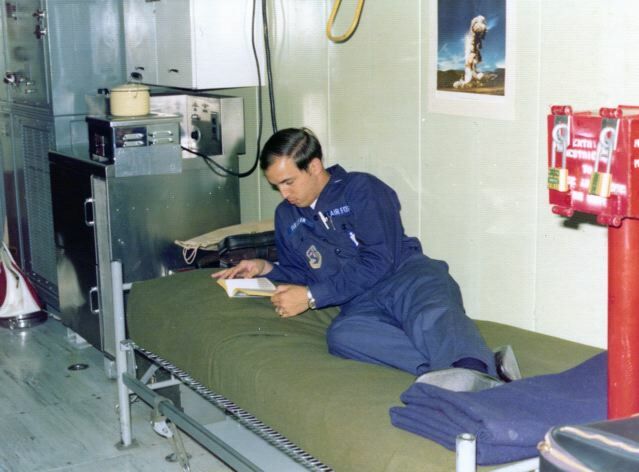 Deputy LCC Crew Commander pursuing intellectual studies (maybe). The photo on the left is of what was unaffectionately known as the knee knocker. 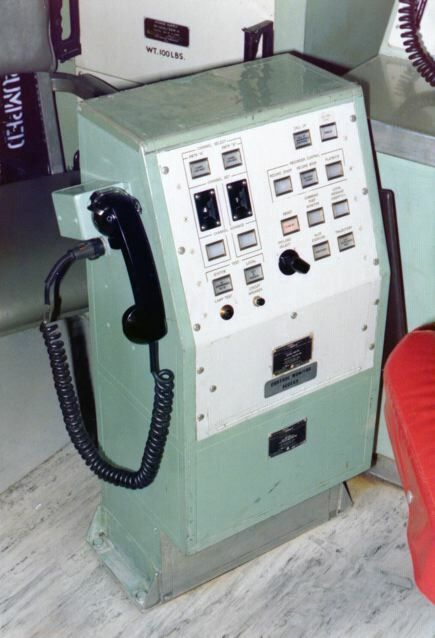 It was used to record a copy of the go to war message on six ERCS (Emergency Rocket Communication System) missiles located only in the 510th Strategic Missile Squadron at Whiteman AFB. Those six missiles did not have atomic warheads, but instead radio transmitters used to broadcast the war message out over the western U.S. and the Pacific Ocean, and eastward out over the Atlantic Ocean. 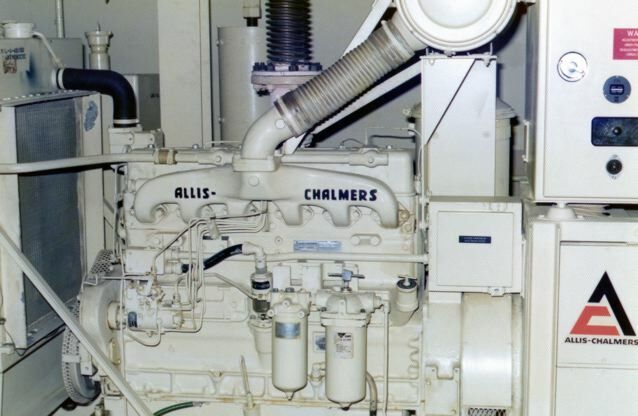 Such transmissions might be especially important to submarines and ships because nuclear blasts can disrupt normal communications. 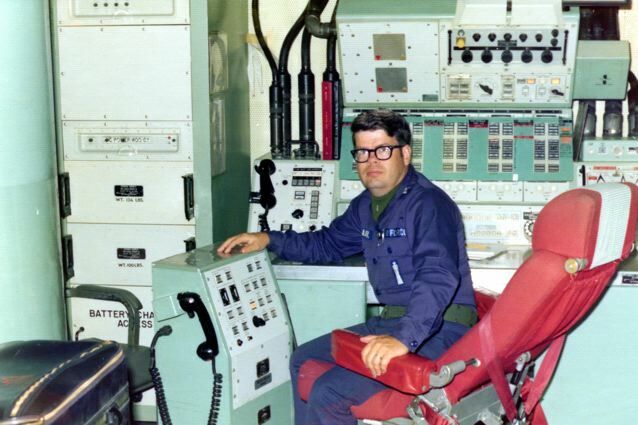 I and my deputy, Lt. Jerry VanLear, Launched an ERCS missile from Vandenberg AFB in March of 1972. It worked fine, the message I had recorded on the knee knocker began broadcasting a minute or so after launch. 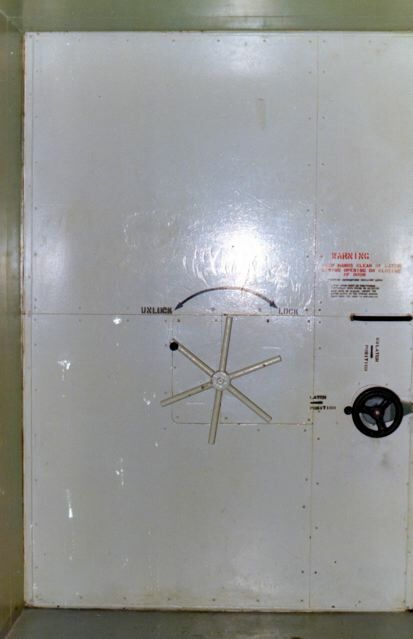 The photo on the right is the safe where the launch keys were kept as well as the documents used to authenticate a launch message. but be sure it was very imporatant to the war effort (and some other efforts too). 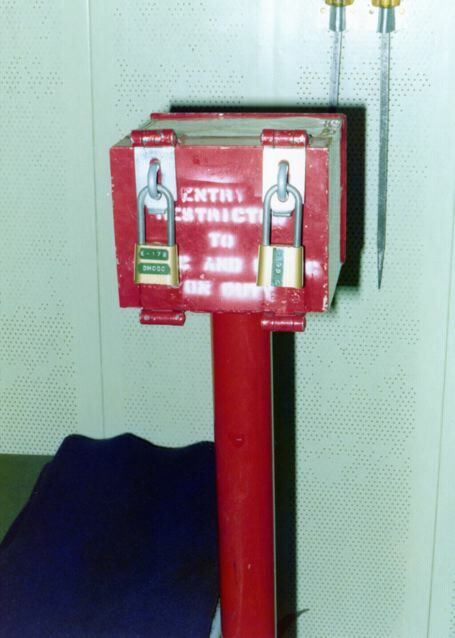 At the time I was assigned to missile duty at Whiteman AFB it was the custom to allow individuals or groups to visit any LCC or LCCs in the missile wing. Visitors were not searched nor subject to any security measures other than having to obtain a trip number prior to visiting the LCCs. This was during the time period when terrorists had killed many Israeli athletes during the Olympics (1972). I discussed the visitor procedures with my squadron commander, pointing out that it only took launch commands from two of the five LLCs in a squadron to launch that squadron's missiles, and that it would be quite easy for terrorists to conduct visits to two LCCs in a squadron and then take over the LCCs and launch 50 nuclear missiles resulting in a nuclear war. In fact, it had been nothing but sheer dumb luck that such an event had not already taken place. My commander agreed and asked my to inform Headquarters Strategic Air Command (SAC) of the situation. I spoke to a colonel at SAC who became quite excited when I informed him of how easy it would be to put the U.S. in such an untenable situation. He said he would call me back on the matter and he did so several hours later. He no longer seemed excited or upset at the possible prospect of an imminent nuclear war and asked me to submit an emergency classified change to the regulation limiting visitor trips to no more than one LCC in a squadron at any one time throughout SAC, which I did. After the regulation change was made, I submitted an after-the-fact suggestion through the base suggestion program outlining the extreme danger we had been in and that it was only by great luck that the wrong persons had not become aware of the situation and taken advantage of it. Sometime later I received notice that the suggestion had been adopted by SAC and I was given an award of ---- $50. The award letter stated that the suggestion had provided "moderate and extended benefits." I spoke to the little old lady in tennis shoes in the suggestion office at SAC who had approved the award and she told that it was worth no more than $50 because it only affected six SAC bases! Several years later I happened to be working in the same organization with an officer who had been at SAC Headquarters when my call was received. He told me that the apparent calm of the colonel who had called me back was just that, apparent. He said that my call had turned SAC headquarters upside down and that they were frantic to devise a method whereby the possibility of such a catastrophic event taking place could be positively eliminated. Merely depending on bases strictly adhering to the changed LCC visitor regulation would not be sufficient. 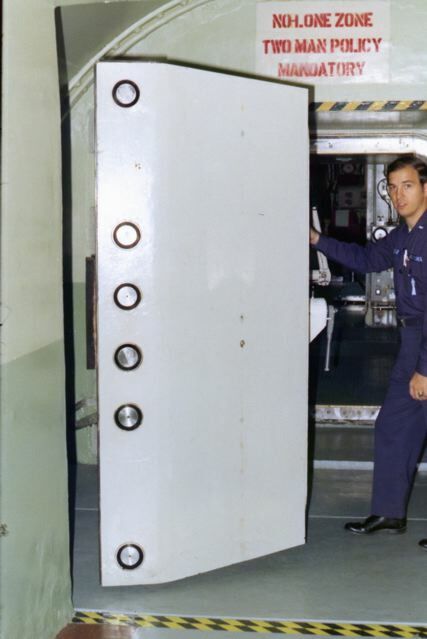 The end result was that changes were made to procedures and LCC equipment whereby the crew would receive coded information in a launch message which had then to be inserted into LCC equipment before the missiles would respond to launch commands. That change absolutely prevented unauthorized launch of missiles by anyone, including the LCC crews themselves. It would be my guess that this incident represents the most benefit for the least amount of money that any government anywhere has ever received.